How to get there: From Ålesund, follow highway E39 towards Bergen and then Hwy. 60 (towards Stranda) to the Magerholm - Ørsneset ferry (approximately 8 kilometer). This ferry runs quite frequently. Continue along Hwy. 60 for about 25.2 kilometer to a parking area on your right hand side, just as you reach the highest point of the road on Strandafjellet. Route description: Cross the road from the parking area, then head a few meter along the road in the direction of Stranda (east). Pay attention and locate a clear trail that leaves the road and heads uphill. Follow this trail as it climbs and crosses some wet areas before reaching the end of a very small lake. There is a trail fork here and signs giving directions and hiking time estimates to various destinations. Follow the sign for Roaldshornet (left fork) and continue to traverse the slope up on your left side. After a while you will reach a local high point (there are a couple of trails, one traverses below, one heads more across the top). 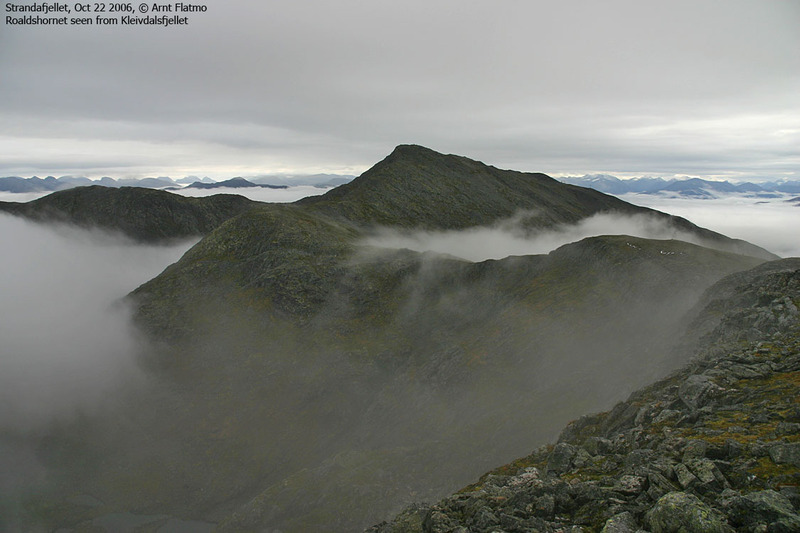 From here, you will see the connecting ridge to Roaldshornet straight ahead. 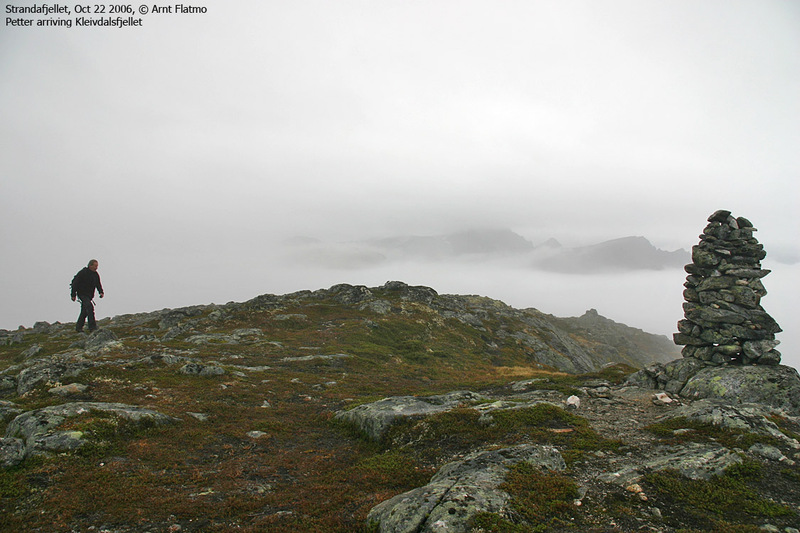 The highest point (with a cairn) of Kleivdalsfjellet is now a bit behind you to the left. Descend the broad, gentle ridge, then complete the climb of Roaldshornet by following a slightly steeper trail that zig-zags among cliffs in order to reach the top plateau. Comments: I did this hike with my friend Arnt. We first dropped off Anthony above Hundeidvika, his plan was to do a week hike south on the east side of Hjørundfjorden. The weather was rain and fog. We already had decided to change from plan A (Vassdalstinden) to plan B (Saudehornet). After waiting for the ferry across to Festøya for one hour, they informed us that there would be a major delay due to a missing crew member. Time to move to Plan C, Roaldshornet. We drove back up to the trailhead and started out at 1045. The fog was pretty dense, but the rain had ended. To our great delight and surprise, we ascended through the lower clouds (fog) and emerged out in a layer of good visibility with another (high) layer of clouds further above us. A rather interesting scenery, a white ocean of clouds below us, then all the major peaks coming up all around us. Our route took us slightly south of Kleivdalsfjellet (1154 m), then across the broad ridge connecting it to Roaldshornet and a short stretch up to the summit itself. We arrived at the summit at 1245 and spent 15 minutes there. On our return hike, we stopped by the summit of Kleivdalsfjellet, 1154 meter. Its primary factor is 91 meter, just short of making my 100 meter criterion. However, given its distance from the parent Roaldshornet and the general look of the terrain, it certainly is a very fine subsidiary mountain. 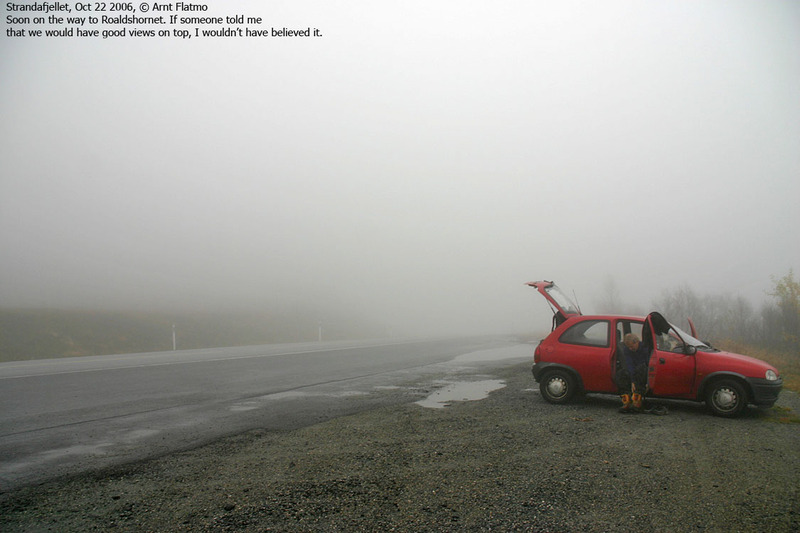 We were back at the car at 1415 after a nice hike bringing us back down into the lower layer of clouds. At the trailhead, the weather does not look great. Roaldshornet, as seen while crossing Kleivdalsfjellet. Kleivdalsfjellet. I am approaching the cairn.